Many of us own solar filters, or employ safe solar projection techniques, and enjoy keeping tabs on current sunspot activity. And what better way understand what we are looking at than to learn a bit more about them! Sunspots are places on the Sol's photosphere where the temperatures are 3,600 degrees farenheit cooler that the surrounding sunscape. This is why they look dark! They appear where the Sun's magnetic field is trying to emerge through the photosphere, and effectively act as a "scab" upon the surface to keep the rising energy from reaching the surface. The sunspot's dark central region is know as the umbra and they are often surrounded by a much cooler, lighter halo known as the penumbra. The spots themselves are super-magnetized, containing a strong negative, or postive charge... and sometimes both! This next series of "lessons" is dedicated to learning about sunspots and to follow along on the life cycle of one that most of us have recently observed... Giant 39! One of the first things a solar observer needs to do is to identify the area that you are looking at. Each sunspot group is given a Boulder Sunpot Number. These numbers give us a common point of reference in both reporting and accessing data. Using a formula devised by Rudolf Wolf in 1848, scientists track solar cycles by counting sunspots as they appear on our visible surface. But it's not quite as easy as it sounds! Using a pair of solar safe binoculars might reveals as many as four or five at a given time, while our average telescopes might reveal as many as 50! Now that we know how to identify a sunspot number with an observed area, let's dig deeper into our information! There are two types of classfications - MacIntosh and Zurich. (of course there is modified zurich in there too, but i don't have any idea of what that means... so don't ask!) Both are basically the same. So let's have a look! Sunspot groups are classified by a three letter code. The first code letter deals with the group type. The second code letter describes the penumbra of the largest spot of the group. The third code letter describes the compactness of the spots in the immediate part of a group. A: Unipolar group without penumbra. B: Bipolar group without penumbra on any spots. C: Bipolar group with penumbra on one end of group, usually surrounding largest of leading umbra. D: Bipolar group with penumbrae on spots at both ends of group and with longitudinal extent less than 10�. E: Bipolar group with penumbrae on spots at both ends of group and with longitudinal length between 10� and 15�. F: Bipolar group with penumbrae on spots at both ends of group and with longitudinal length more than 15�. H: Unipolar group with penumbra. r: Rudimentary penumbra partly surrounds largest spot. s: Small, symmetric penumbra, elliptical or circular and N-S size smaller than 2.5". a: Small, asymmetric penumbra, irregular in outline and N-S size smaller than 2.5�. h: Large, symmetric penumbra, N-S size larger than 2.5�. k: Large, asymmetric penumbra, N-S size larger than 2.5.
x: Assigned to (but undefined for) unipolar groups (types A and H). o: Open - few, if any, spots between leader and follower. i: Intermediate - numerous spots between leader and follower, all without mature penumbra. c: Compact - many large spots between leader and follower, with at least one mature penumbra. F - bipolar (containing both a positive and negative charge) with penumbra on boths ends exceeding a longitudinal length of 15 degrees. k - the leader has a large, asymmetic penumbra with a N/S size larger the 2.5.
i - and that the group is intermediate with many spots between the leader and followers without mature penumbra. alpha - A unipolar sunspot group. beta - A sunspot group having both positive and negative magnetic polarities (bipolar), with a simple and distinct division between the polarities. gamma - A complex active region in which the positive and negative polarities are so irregularly distributed as to prevent classification as a bipolar group. beta-gamma - A sunspot group that is bipolar but which is sufficiently complex that no single, continuous line can be drawn between spots of opposite polarities. delta - A qualifier to magnetic class indicating that umbrae separated by less than 2 degrees within one penumbra have opposite polarity. beta-delta - A sunspot group of general beta magnetic classification but containing one (or more) delta spots. beta-gamma-delta - A sunspot group of beta-gamma magnetic classification but containing one (or more) delta spots. gamma-delta - A sunspot group of gamma magnetic classification but containing one (or more) delta spots. Now, let's take what we know of magnetic classifications and have a look at what's going on inside the sunspot magnetically. Once again, we are using our most current area of Spot 39 and environs... And they take center stage in this SOHO magnetogram! Using this type of readily available information, we can literally "see inside" the interior workings of a sunspot group and judge what happens by the appearance of both positive and negative fields. 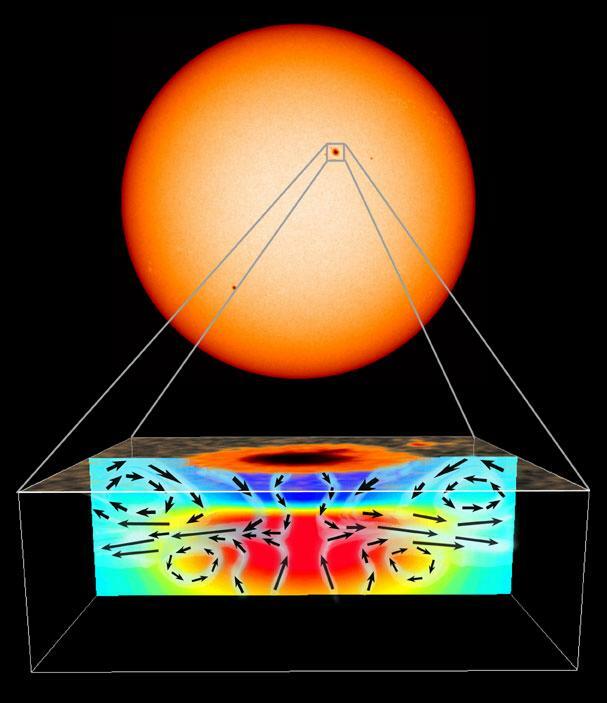 The strength of the magnetism is measured in "gauss"... and the typical sunspot carries about 2,500 gauss in either positive or negative energy. Not impressed, huh? Then think on this... The total combined magnetic energy for Planet Earth is less than one gauss! Trying not to stray too far away from the subject, but the normal 11-year sunspot cycle has a 22-year magnetic cycle superimposed over it. During the first 11 years, all the leading fields on one side of the hemisphere will have positive energy first, while on the other side, negative begins the race across the surface. During the next 11 years, they switch! This is known as "Hale" value. Of course, latitudes and longitudes are something that most of us in astronomy already understand, so let's just concentrate on the data for spot 39. Using what we have learned so far, we have a classfication of "Fki" which is a region notorious for producing all manner of flare activity, and a beta/gamma/delta class magnetic field, which can lead to even more startling reactions! X-Class - These flares are big ol' boys! They are major events that can trigger planet-wide radio blackouts and long-lasting radiation storms. M-Class - These flares are medium-sized and they generally cause brief radio blackouts that affect Earth's polar regions. Minor radiation storms sometimes follow an M-class flare. C-class - These flares are small with little impact for Planet Earth. This next part of the lesson deals with what we can observe "virtually", and is an important key to understanding what we see in the telescope. Let's chose on particular date - July 28... And explore! Thanks to the extreme generousity of NASA and the SOHO program, I have permission to show you a variety of SOHO cameras, and attempt to explain how each of them works. By far, my favourite is the MDI contiuum camera shots. Our Sun is constantly giving off wave oscillations on the surface. These waves can be caught by Michaelson Doppler Imaging (MDI) and displayed as doppler shifts across the solar surface. Through ultraviolet imaging, we are know allowed to view the photosphere in ways we never dreamed possible! Awesome, huh? It's hard to believe the amount of energy the comes from the Sun until you see it for yourself! Another great was to observe details of the Sun is through coronographs, and the SOHO/LASCO camera is just your ticket to the show! See? The C3 camera can even show us the stars and the planets!!! Now, as we come to a close on this lesson, let's take a look at what happens to some regions! Cornonal Mass Ejection (CME) - This is a huge burst of plasma escaping the solar surface, and is highly charged across the energy spectrum. Thanks to SOHO/LASCO, we are able to witness this type of event firsthand! When energy of this type reaches the Earth (if it is directed toward us) can cause some awesome auroral displays! These things are just too cool! Once again, our current solar conditions have produced an awesome display! Can you imagine the power gushing out of this baby?! And, although this one is directed toward the Earth, the brilliant spot in the center in none other than an X-class flare! You are quite welcome to view some of my "homespun" photography of sunspots at Sunspot Gallery or visit with current photos and observations at The Daily Observing Reports. "She blinded me with science..."